A range-restricted species (EOO 6844 km²), that is becoming increasingly rare due to ongoing habitat loss and degradation. There are an estimated five to eight remaining locations, but it is also possibly overlooked in areas where fires are excluded. Velddrif to Tulbagh and the Cape Peninsula. Stony lower slopes and coastal flats, predominantly occurring in clay soils derived from shale, granite and silcrete. Urban expansion has caused the local extinction of this species on the Cape Flats around Cape Town and Kuils River, and habitat loss to urban expansion continues around Tygerberg, Malmesbury, Stellenbosch and on the Vredenburg Peninsula. Across the Swartland, it has lost more than 80% of its habitat to crop cultivation, and loss continues. Subpopulations at Tygerberg, Joostenberg, Stellenbosch and near Malmesbury are threatened by competition from spreading, unmanaged alien invasive plants. Apart from the Tygerberg Nature Reserve, lack of fire is a threat across this species' range. Anisodontea biflora is known from many historical records, but recent observations and collections are rare. It is now locally extinct over most of the Cape Flats, where it formerly occurred around Green Point, Black River and Kuils River. Further north, its habitat has been extensively transformed and fragmented. Field observations indicate that the species recruits in response to fire, but that it is fairly short-lived and rare in mature and senescent vegetation. Fires are excluded from many small, isolated renosterveld fragments, which means that dormant subpopulations could be easily overlooked. It has not been recorded in the Tulbagh Valley since 1894, but it possibly still persists in shale fynbos on the lower slopes of the Waaihoek Mountains near Mitchell's Pass. It continues to decline due to ongoing habitat loss and degradation. Bates, D.M. 1969. 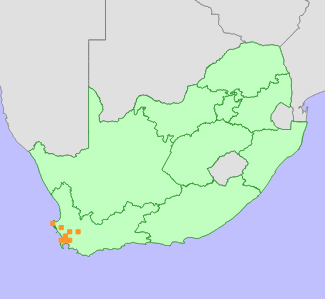 Systematics of the South African genus Anisodontea. Gentes Herbarum 10(3):215-383.